Being a monograph on the leftness and rightness of geared tuning machines. Yes Virginia - there is a left and a right geared tuner. 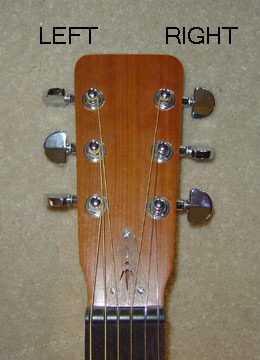 When looking at a guitar peghead - the tuners on the right side of the peghead are the "right tuners" and the tuners on the left side of the peghead are the "left tuners". See Figure1. That seems simple enough and really it is. But not all pegheads are so black and white. 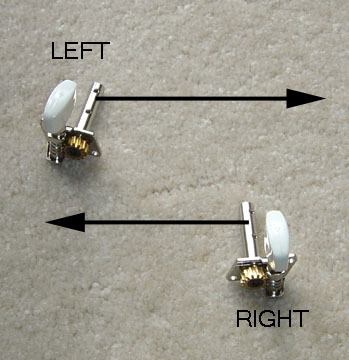 See Figure 2 for a picture of Left and Right Tuners. 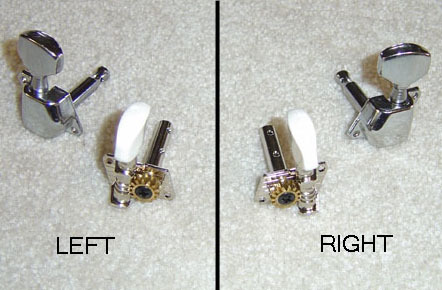 Right tuners have the handle on the right side of the shaft and Left tuners have the handle on the left side of the shaft. The strings should pull on the shaft in the direction of the the arrows as shown in Figure 3. When the string pulls in this direction it tends to push the gear tighter together which helps the gear last longer and function better.